Great sing-along song with a catchy melody and inspiring lyrics. 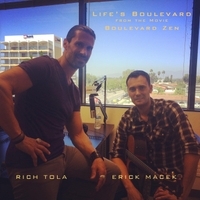 Life's Boulevard was written by Rich Tola and singer-songwriter Erick Macek to capture the essence of Tola's yoga-inspired film, Boulevard Zen. As the tag line says, "Life's a boulevard and sometimes you get stuck". And as the chorus of this catchy song says, "Driving down life's boulevard is no paradise, open up your heart and let it lead you day and night, just do not dwell on things that can't be undone, keep pushing forward til the battle is won." Internationally known Erick Macek has competed on The Voice and was named LA Music Awards Best Male Vocalist of the Year. He is accompanied by guitarist Bill Jones.